If you are new to the slow philosophy, often starting to slow down can be thoroughly overwhelming. People are often not sure where to start, so I have produced this “slow start guide” to get you heading in the right direction right from the start. These “tips” are not designed to be done in order. I recommend you do the breathing and the posture exercises first followed by the thought experiment. After then do the ones you fancy. To see these tips in much more detail, including exercises and additional hints and tips please see the ebook “Unleash the Tortoise Within – A Beginners Guide to Slowing Down”. It is only $4.99, Click here to Buy Now and download instantly! We are used to rushing at things and expecting instant result. Don’t. Don’t try and slow down all at once. All you will do is overwhelm yourself, get flustered, not feel any better and give up. Doing something “slow” for five minutes each day will be much more beneficial that doing it for 30 minutes once a week. I don’t say that flippantly or lightly, we all, obviously have to breath, but very few of us pay attention to our breathing. By focusing on and controlling your breathing, you can calm yourself, focus yourself, energise yourself. Relax, stand up straight, don’t waste energy. We gather all sorts of tensions in our muscles. We collect tension from our worry and our stress from our bad posture, we rarely pay attention to our bodies and allow ourselves to slump or bend or slouch. 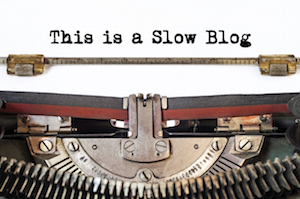 Why do you want to slow down? And what will you get out of it? These are very important questions, you need to know where you are going and why you are going there, otherwise you will just drift. Imagine tomorrow you have slowed down, someone has waved a magic wand and you have got everything sorted so that you have the space to be slow. What would you see?! How would it feel? What would it/you look like? Pick something that you do every day, cleaning your teeth is a good one, or having a shower. Pay attention to the process, engage all your sense; see, feel, hear, smell and taste (be careful with the last one, don’t go licking things inappropriately). Notice all those stimuli and how it feels like it is the first time that you have done it! Make space to be slow. How much of what do you do, do you really need to do? We collect baggage, old habits, thought process and behaviours that we no longer need, but never discard. We find we do things that serve no purpose, but can’t seem to find a way to stop. We consider multitasking as the pinnacle of our ability to be productive, doing more than one thing at once means we get much more done, faster. Right? Multitasking makes us less productive, not more.You see, multitasking isn’t really doing several tasks in parallel, it is just constantly interrupting yourself. It is better to focus on a single task for its entirety (or for a fixed period of time, until you reach a natural break point), you will get more done, more quickly, to a higher quality and less stressfully than if you are trying to do several things at once. No person is an island and slowing down is as much about community as it is about the individual. By being polite, well mannered and conversational with everyone you meet, it encourages you to remain calm, centred mindful and observant. I don’t mean take like a record on half speed, I mean take the time to formulate your questions and answers, breath properly, leave gaps between word, plan ahead, don’t trail off half way through. 10. Notices the spaces where you can be slow NOW. There will be times, (ironically, probably be the times that you currently find most frustrating) when you are waiting for something. Like on hold on the phone, in a queue at the bank, waiting for the kettle to boil. These are spaces, RIGHT NOW where you can be slow. For much more detail about how you can slow down NOW, I have produced an ebook “Unleash the Tortoise Within” it is 30+ pages of hints and tips about how to start slowing down. It is only $4.99.